From Marvy Uchida, the premiere ink and marker manufacturer—permanent alcohol inks in marker form. Perfect for rubber stamping, coloring, blending, and much more. Stamp with Marvy Matchable dye-based ink pads (or any dye based ink) and then color the image with Le Plume permanent markers. 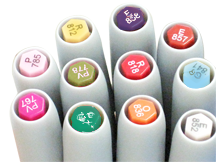 With the Le Plumes it's easy to create a medley of artistically blended colors in your rubber stamped artwork. 141 shades of LePlume Permanent markersare available. Click HERE for the entire selection. This page features 36 of JudiKins most favorite colors. Ink color swatches are matched as best as possible to true ink colors. Individual computers vary so please understand if ink color is not exact.